As a tour guide, people are constantly asking me about the weather here in Evanston. Most of the time, I’m almost positive that they’re referring to the colder months, but I always find myself talking about summer as well. That’s probably because summer is my favorite time in Evanston. I’ve actually spent my last three summers here. The warmer weather, the relaxed atmosphere, and the free time I get to spend with friends having adventures make this the best place to be. The first reason, though, why I stay over the summer is for theatre. 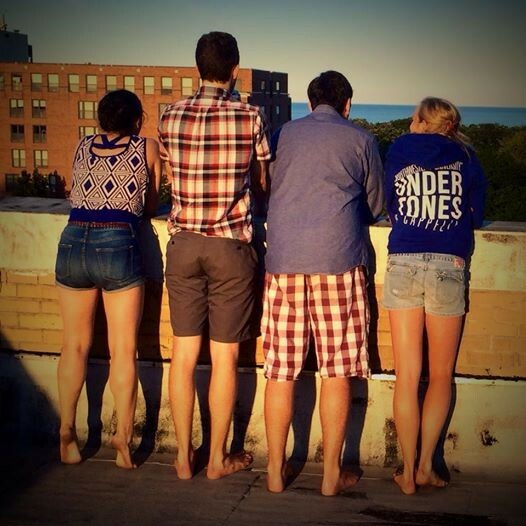 I am a theatre major and I think the Summerstage show here at Northwestern is a great way to continue performing. During my first year at NU, I was planning on going to work at the camp I went to all throughout my childhood for the summer. But, as I slowly fell in love with Northwestern more and more, I realized that I didn’t want to leave. They had announced that due to casting changes, they were going to hold late auditions for the summer production of Pirates of Penzance and I jumped at the opportunity. Ever since then, I’ve always stayed. I got my 119-0 class credit over with last summer by assistant stage managing Into the Woods and this summer I’m performing in Hair. These theatrical experiences often are the framework around a very formative, fun, and interesting experience that is a summer in Heavenston. One of the best parts about summer is the chance to go to the beach. Some of my best memories have been times spontaneously deciding to go to the beach. For example, my first summer in Evanston, my friend, Véronique dragged me to the beach within my first hours of being here. I was slightly confused; being from Long Island, a beach meant you were near the ocean. But, we crept along the sailing center, which was being renovated, and took a dip in crisp Lake Michigan. Just swimming with a couple friends on a beautiful summer night was all I needed to know that Evanston was my new home. Another great part about the summer is going to the movies! This might seem like the exact opposite of what you might want to do if it’s really nice out, but on those hotter days when your apartment’s air conditioning bills can really pile up, Century 12 Evanston is a great place to find an escape. The $5.75 deals on Tuesdays are the best bargain in Evanston. That’s how my friend, Benton, and myself found ourselves seeing Minions last summer and falling asleep about a quarter of the way through the movie! In addition to these great things, I definitely have to say that there are some annual summer traditions. The Fourth of July has some of the first that come to mind. Every year, my friends and myself gather on the roof of Evanston Place and watch the fireworks show. Usually someone has a watermelon and we get snuggle up with each other, enjoying the company. Another annual tradition is the Oh-BQ! This is something that my friend’s family conducts for the theatre community every year. He lives in Wilmette so his family brings everyone over to the house for a night of amazing food and fun. The name comes from his last name! These traditions and others generally will offer some sort of stability during summers of spontaneity. Finally, I’ll say that exploring Evanston’s different food options is a great part of the summer. On many nights a week, you can find a bunch of theatre majors hanging out at the Celtic Knot. If you get the back room (nicknamed the Snug), it can be a very awesome night! Also, Epic Burger is awesome if you want a really good burger of choice. I personally love going to Todoroki for their amazing sushi. Buffalo Joe’s is a great option later in the evening. Last, but not least, if I’m going to be completely transparent, Chili’s is also an awesome spot. With the amount of deals they have over the summer, it’s definitely worth it to check out if you’re alright with going to a chain. I’m so glad I’ve stayed this summer. Whether it’s working with prospective students as a tour guide, doing innovative art with Matt Hawkins in Hair, or just hanging out with my friends, Evanston is definitely the spot over the summer.